With the P-12 Adjustable Stand you get more than just a place to keep your bike, you get an adjustable stand with 11 different height positions that can be changed from 9.5 to 14.5 inches tall for a ton of adjustability. Storing your bike? Drop the stand lower and save some space. Need to do some maintenance? Bump the stand up so you don’t have to bend over as much. The best thing? When your 50cc to 650cc bike is on the stand, just step on the foot lever to raise it up. No heavy lifting. And once it’s up, the widespread arched legs keep everything upright and stable. So when you’re tired of wobbly stands, hunching over, and deadlifting your bike, pick up the P-12 Adjustable Lift Stand from Motosport Products. Well made. Good color and powder coat finish. Feels ridged and tough. Very easy to use. Easy to lift bike and very sturdy. Good size platform greatly improves bike stability when working on bike. Only negative is not able to quickly adjust lift stand height for bikes with different ground clearances. Risk of stand damage if height is set too high. A huge upgrade from the previous stand. Large sturdy platform and many adjustable positions means this stand should be able to work with many motorcycles. Highly recommended Even comes in Husaberg blue! Works perfect, is lightweight and easy to use. Highly recommend! I bought my wife a CRF150RB. With her bike being the big wheel version, I was torn between a full size stand and the mini stand. The stand is adjustable and fits both. Place under bike, step and let go. To release step on release pedal. Super simple. Ive looked at others and this one is built well. Aluminum, welds are sturdy, beefy, finish is nice. Im 51yo and lifting bikes on buckets or MX stands gets old. This is a breeze. Sturdy and easy to use. The lowering peddle makes this stand ultra simple to get the bike down. Able to get both wheels in the air too. No more dead lifting my bike, now I just step on the pedal and up it goes. It is very easy to use. I like how it is very adjustable, but I wish that it had just a bit more lift when you step on the pedal. In the garage it gets the bike a few inches off of the ground, but in the dirt or grass I wonder how much it will lift without having the lift adjusted so that it barely fits under the bike. You do have to be careful when you let the bike down that the lever doesn't wack you in the leg. Overall, satisfied with this lift stand. It is helpful when tired and when not tired. The construction is good and it looks good. Ido recommended. Nice in the garage...marginal at the track. The motorsport P 12 stand is well manufactured. It looks great and performs well in the garage. The issue I have with the stand is at the track. While it's adjustability is good and it functions well on level surfaces, it's not so great on grass or uneven ground. The range of lift motion is inadequate to allow for both clearance under the bike while the stand is down and wheel clearance from the ground when the stand is up. The description of this stand does not clearly state the range of the lifting motion...only the adjustability range. If this is important to you, I would suggest further research. Works just as described and makes working on my bike that much easier. I leave my bike on this stand whenever its not being used. Never any issues. 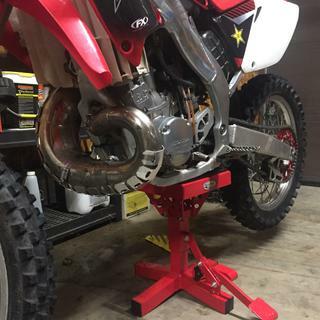 This Motorsport stand is great for lifting and holding up your dirt bike. It is easy to use, sturdy and will save your back from the constant stress of lifting your bike. Very strong and reliable stand, I would recommend this to anyone as it is no work to move your bike up and down and off the stand, also looks great and lasts very long time. 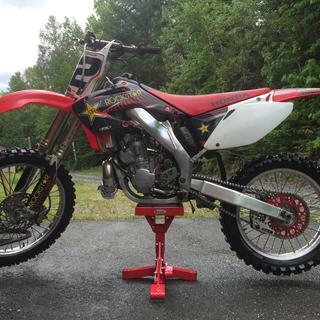 The Motorsports P-12 adjustable lift stand is a great piece of equipment to have if you own a dirt bike. It is so easy to get your bike on this stand. simply align the stand under your bike and press down on a lever with your foot and your bike is on the stand. Wish i had one of these a long time ago. This is a very good stand. It has a wide platform and easy to use. This is my second one because I bent the foot peddle arm on my first one. I bought another one because it works good (until the arm got bent). I am going to see if I bent the arm because the joints got loose (my fault) or if the arm is just too soft and bends easily. This lift is smooth and holds the bike securely. Great for single bike use but, a bit cumbersome if height adjustment is needed to use for a different size bike. Nice stand..Well built but nothing fancy..Way overpriced..Someones making a nice profit with this stand. Easy to assemble, easy to use. Stand works great for lifting my KTM 690. I decided on this stand versus a "fixed" mounted version as I don't have a great place to lift my bike up. This stand came in the lowest setting and took about 5 minutes to position my bike onto. The quality and finish work is well done and do to the simplicity of the lever and over all design I'm thinking this will be a great stand for years to come. I only gave it 4 stars on durability because it is new and only used a couple of times. I bought this stand in green to match my bike. I love it! This is way better than lifting the bike on a pedestal each and every time. Very well built! Can't think of any improvements, except maybe rubber on the foot pedal. Best stand there is for dirt bikes. Once you adjust to fir required height, it's ez to use, and supports great. I have tried plenty of stands over the years, & these are the best engineered stands out there IMO. I use them for all my dirt bikes. As good as it gets. Quality and functionality. One of the few that are worth the price asked. This is far better than a fixed bike stand. I quickly grew tired of "hip tossing" my bike on my cheap stand. This thing works great, easily to raise the bike up, and the foot release is really handy. bought this a about 3 years ago. 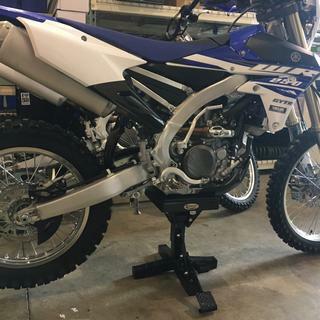 When I went to readjust it to work with my stock yz250 (with a skid plate) the holes did not line up well so I had to re-drill them. It does not have quite enough lift so it either does not fit well under the bike or barely gets one wheel off the ground. In uneven terrain (dirt) it often will not get either wheel off the ground. now the lift arm keeps bending to the side and the linkage is so loose that it will no longer toggle to stay in the up position. Great stand to have for doing maintenance on your bike. 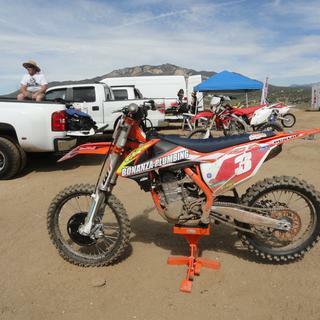 On the highest setting it lifted my front and rear tires about 3 and half inches of the ground on my crf250r. Lean the bike back a little on the highest setting and you get about 6 inches of clearance in the front. Nice wide base on the stand, no wobble. Platform is wide too, so plenty of play room to sit the bike on. The plastic/rubber cover on the platform is bolted down so it's going to not peal or break off. Although on mine some of the nuts holding down the bolts were loose or missing so check that and make sure they are tight. Stand comes fully assembled. Only work you have to do is adjusting the platform to your bikes height. Worth the buy even if you gotta add/tighten down the bolts. Holds my bike and me on it with no problem. (I don't recommend getting on the bike while it's on your stand). Reason I give it 4 stars is because a little bit of the paint was chipped or worn off. The missing bolts, and motorspot emblems that are pop riveted on the side of the stand came with on rivet already missing/broken. I'm not sure if it was shipping damage or packaged that way. I've bought over 15 items from here and never had issues before. I have looked at these for years before I finally saw this on sale and bought it. I don't remember what it cost, but I love it!!! Stop looking and buy it. Be advised, this one is very adjustable - most are not as adjustable as this. It is also very stable. I have had it for nearly two years and it is the one item I won't bring in the trailer with me cause I know someone will "borrow it". They all love it, but won't spend the $100...they just wish they had one! At first my riding buddies laughed at my stand, then they started borrowing it rather than struggling to get their bike on a conventional stand after watching me. Now they have several of these stands. Very rugged and well made with a lot of vertical adjustment. Very easy to set up to your bikes height! Awesome lift system makes it easy to store or even work on the bike off the ground! A must have in my opinion! Solid, great quality product. Very easy to use. good height adjustment - we have used this stand on a honda 150r and a ktm 200xc w and works fine. It was missing a screw or two it works ok though could be better. I bought the black one and the paint chips really quick, the plastic caps on the end of the legs fall out rather easy as well. But besides the cosmetics it works well. I got the powdercoated stand. No sharp edges, packaged well. Just needed a couple small adjustments in height. The best stand, hands down. Easy to operate and stable holding the bike. Durable and easily adjustable. Makes working on the bikes much easier. Had a cheap Harbor Freight before this and wish I hadn't wasted the money on it. Spend the extra money up front and you will be saving money in the long run. I have had this stand for many years now and have not experienced a single issue. I would definitely buy another. This is a back saver. I pull off the track and lift my bike up while my buddies heave their bikes on stands and then complain about back pain. A little pricey compared to some cheaper competition but the build quality is there. Works great for me KTM 350 EXCF. I have tried several lift stands over the last 20 years, but never found on that I really liked, until this stand. This is a great stand for the price. If your looking for a great lift stand, look no further. BUY IT. I get picked on by my MX buddies, but I don't care. After a long summer ride makes getting the bike on the stand super easy. “Height ranges from 9.5 to 14.5 inches tall” Does that mean it works on bikes with that ground clearance? Or that it will raise the bike by that amount? Yes it will work. It will also raise it up so both wheels are off the ground. That’s the minimum to maximum platform height range. Does it have a locking position? So when my bike is lifted i accidentally don't drop it the stand down. BEST ANSWER: It locks in the up position yes. It is released with foot pedal. Yes, it has an over center lock, locked and unlocked by the lift pedal. It does not have a safety pin or block, so if you push the foot pedal hard enough to push it back over center it will come down. Not likely to be activated by mistake and you could easily drill a hole for a safety pin or block it. When the stand is extended it doesn't lock, but it will stay up. It has a lever you can swing over to lock the stand. I took the lever off and drilled holes and insert a Phillips screw driver in the holes to prevent the stand from dropping. Hope this helps. It doesn't have a lock, but you have to press the release pedal quite firmly. It's a very nice stable stand. I have two other brands but this one is the one that makes it into my trailer and gets used the most. It does not have a locking pin. You have to step on the small release lever to drop the stand down. I have been using these for 2 years and never had one drop down. It is deigned to stay up, a lever to depress to realese and it comes down quick so stand back. Yes, you must firmly step on the release lever to lower the bike. Yes, when you step down on the foot pedal, it locks in place. Is this stand made out of steel or aluminum? I have purchased and aluminum one at a dealer a couple of years ago and the bottom legs bent and also to top pad area. Not happy and don't want to go through that again. BEST ANSWER: My guess, based on its weight, is this stand is made of aluminum. That being said, this is my second one of these stands and both have been super durable. Both have lifted some pretty heavy bikes, too (KTM 690 Enduro, XR650L, etc.). One bit of advice that helped mine was to make sure you have the stand height set appropriately for your bike's height when lowered. If the stand is set too high, it can cause stress on the stand when the bike is lowered (bike springs compress and slam down on the stand). A previous, cheaper stand I had wasn't very height-adjustable and its legs eventually bent from too many harsh lowerings of the bike. Hope that helps!! The stand is made from steel and is a durable assembly. The height adjustment range and weight capacities are adequate for my KTM 640 and Husqvarna 350. It's made of steel. Good and solid. I adjusted the height to match my CRF and have had no issues with it. It's steel, and seems plenty strong. I've had no issues with it. I've even had my xr650L on it a few times (weighs about 350lbs). It's made of aluminum and it's very study and adjustable. I consider it a good purchase. It is made out of steel . It has held up well for me. Will it lift a Husqvarna 701? BEST ANSWER: Wow...good question! I lift my KTM 450 (250 pounds) all day long with zero effort. I stuck my 100 pound daughter on and still had no problem which would bring us to the weight of the Husky 701. Because I have years of experience with this and have to protect it from my buddies, I would highly recommend it. Don't forget that you often only lift the front or rear up depending on where you position the lift. When I center the stand and lift the whole bike (very rare), it still works awesome, has no issues and should not be a problem. Finally, if you own a 701, you will likely have other bikes and this is overall a "must have" tool for anyone with a dirtbike. I don't know what a Husky 701 weighs but this stand easily lifts my KTM 350 EXCF (235 lbs). The stand is very sturdy, can't imagine it wouldn't lift your Husky. They are designed for 50cc to 650cc motorcycles. How high does it lift in the highest up position?